I absolutely love love love the Duo Diaper, I had to rave about it here! It combines the ease and convenience of a pocket diaper with the leak proof protection of the Thirsties Fab Fitted and Duo Wrap. Thirsties sent us one Duo Diaper in size two to try on our 11 month old, 19 pound baby girl. FIT: I have tried one-size diapers and while they are OK, they will always be a little big on a newborn and a little small on a two year old. The Duo Diaper solves that issue with two perfect sizes. Size one fits 6-18 pounds and size two is for 18-40 pounds. The size two fits our 19 pound girl perfectly with the second snap setting, she has chubby thighs :) With just two Duo Diapers you are essentially getting six sizes that grow with your baby. EASE OF USE: The Duo Diaper is really easy to use and wash. The velcro makes it as easy and convenient as disposables, a lot cuter for sure though! The babysitter or hubby will not mind this one at all. Because it is a pocket diaper it also dries a lot faster than an AIO (all in one) or the Thirsties Fab Fitted. I also like that when I throw them in the wash I don't need to secure two sets of velcro tabs like on the Fab Fitted and Duo Wrap. VALUE: Here is what I really love about the Duo Diaper: just two sizes from birth to potty. That results in a perfect fit both on a newborn and a toddler and only two sizes. Now if you have several babies back to back this is perfect because when one size is outgrown by a toddler it can be passed on to the next baby. Talk about getting the biggest bang for your buck! The Duo Diaper costs $18.50, which is about average for cloth diapers - but this is not your average diaper, so consider it a really great deal! Plus it comes with a microfiber and a hemp insert so you can customize absorbency as needed. By the way, these diapers are made in the US! 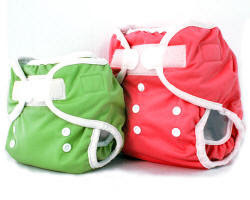 Thirsties is generously giving away one Duo Diaper to an Eco-Babyz reader! 1. Visit the Thirsties website and tell us what color Duo Diaper you want if you win. 2. Tell us what subjects you would like to see covered in Eco-Babyz parenting and green living articles. 6. Tweet about this giveaway (once per day). Include link to this post and tag @Ecoblogz! Leave your Twitter name in the comment. 7. Visit the Thirsties website and tell us something you learned about them. 11. Share some constructive criticism on the design of the Eco-Babyz blog. You can also become a fan of Eco-Babyz on Facebook or Thirsties just for fun. That will give you zero entries though because Facebook has new rules for promotions and giveaways. Contest ends at 11:59 p.m. EST on Sunday Jan. 24. The winner will be selected using Random.org on Monday, Jan. 25, and notified by email (so please be sure I have a way to get in touch with you). Open to US residents only. Thank you! I did not receive payment in any form for this review. I did receive a sample of the product or service for testing and review purposes. This will in no way sway my opinion of the product or service. The review is in my own words and is my own opinion. Your results and opinion may differ. Yay! I love Thirsties! I would choose either ocean blue or meadow! I learned that all of Thirsties fabric and components come from US mills and factories! I like the Storm Cloud color best. I learned Thirsties was launched in 2004! I love Thirsties covers so I'm excited about possibly trying the diaper! I would choose ocean blue. i love the ocean blue color!! i learned that all their products are PVC free! I learned that Thirsties is based out of Colorado, and is made by woman, many of whom work form their own homes. I would love the Rose Duo Diaper - thanks for the great giveaway! I love that all the fabric and components of the Thirsties products are made in the US! I like the Meadow color. I like the Meadow color. I now follow this blog! I learned that all products are made in the US, which I am a big advocate for! I really like the GREEN! I follow via Google Friends Connect. I subscribe to email via Feedburner. I like the orange color! I would be ridiculously boring and go with white. I haven't taken the plunge with the whole clothe diaper thing because it all just seems too confusing... how am I supposed to know what size, what inserts, which brands... there are too many choices, I need something simpler. 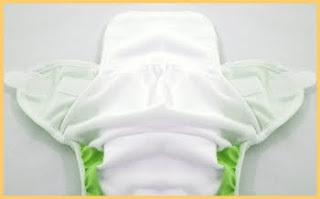 Just 2 sizes from birth to pottie makes it all much easier, this is perfect! My bit of constructive critisism is to add a little something about the object/mission of the blog as a sub-title of sorts or if it's more than just a sentance or two, maybe a little blurb as the first well in the margin. I learned that Thirsties' new hemp jersey is like no other on the market.They have a knitter right here in the USA to custom knit the hemp textile to their specifications. So the hemp is thicker, softer, and holds-up better than any other on the market . Learned Thirsties are made right over the border from me in Colorado! I would LOVE LOVE LOVE the Meadow Duo Diaper!! I think I would choose the storm cloud. Or the honeydew. Or the Meadow. I am following through google friend connect! I learned that all fabric and components are sourced from US mills and made in Colorado. Love that! I like the ocean blue. I love the Ocean Blue Duo Dipe. I would like to see something about infant massage. I love it and think it's so good for babies and you hardly see much information on it. All of their products are proudly made in the USA in Colorado!! Google Friends Connect New Follower! I like the raspberry diaper so cute! I don't see official colors, but I love the orange/pumpkin color! I learned that just by using Fab Wipes you can save $500! I would choose the Meadow Green! I would love to see blogs on Green Cleaning and Clever Eco Friendly solutions! 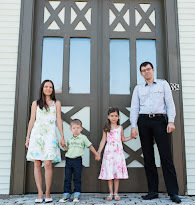 I follow your blog publicly! I love that all of their products are made in Colorado! I would love one in storm cloud. I follow using google friend connect. I learned that Thirsties products are all made in the US. We have a girl, and yet because we bought mostly all used or outlet diapers, we have only one "girly" diaper. I would love to have a rose duo diaper! I would like Rose. Thanks for the chance. I love the ocean blue color! I follow thirsties on twitter! Machine wash warm or hot. Dry in dryer or hang to dry. Made in the USA. I like the Meadow color. Although the plain white is always a good go-to. I'd choose orchid if I won, because I love purple! These look like great diapers! I have to say I like the idea of this diaper growing with the baby. I remember going through 5 sizes of AIO with my daughter from birth to potty! I like the mango color! I love the Rose color! I would like to see environmentally friendly methods of cooking covered in Eco-Babyz green living articles. I learned that the company is located in Canon City, Colorado. I subscribed to your blog. I recently came across your blog and have been reading along. I thought I would leave my first comment. I don't know what to say except that I have enjoyed reading. Nice blog. I will keep visiting this blog very often.